The decision to put up a law blog did not come easy. The first and strongest argument against a legal blog is the formality that has come to be expected from anything related to the practice of law, (i.e., dress codes, codes of conduct, rules of court and other codified rules of behavior). A blog, therefore, would appear to be an anathema to this strict and rigid environment where the observance of rules and protocols takes primacy. The term “blog” itself (a contraction of the words “web log” to the cyber-challenged; a blawg is a law blog), in fact, speaks volumes about the kind of themes and environments one can expect from this evolution in internet communication. The general connotation, after all, is that a blog is, at its very core, an informal venue to share information. Blogs have in fact become sounding boards for the free exchange of ideas, sometimes even a venue for “selling” or in more politically correct terms, “promoting” world views. At first blush, therefore, there appears to be two mutually exclusive ideas: the free-flowing-most-anything-goes world of bloggers and the highly “cannalized” or rule-bound world of lawyering where self-promotion is considered a mortal sin, on a head-on collision where in the end, there could be only one. Law students are taught that the law is a jealous mistress (or in deference to all things gender sensitive, its equivalent male term – jealous gigolo). However, blogging is just one of the many means to ensure that attorneys and law firms shall at all times remain dynamic and relevant. The Law itself is evolving (albeit at its own pace, much like the proverbial tortoise which ambles slowly, but which is sure to reach the finish line anyway) and lawyers must keep pace with the advancements in the broader world stage. An institutional law firm, whether in the Philippines or elsewhere in this porous world, is no longer limited to the geographical location of its head office. Each must, therefore, find means to contribute to the development and dissemination of the law in the best manner possible (within the ambit of legal ethics, of course) to the broadest possible audience. Furthermore, this fact becomes more relevant when we consider that a counsel’s function is not limited to the representation of his clients, but also includes the task of disseminating the law to the public. Each lawyer is, of course, an officer of the Court who is tasked with aiding in the achievement of justice in its broadest sense. This, we believe, includes the dissemination of even just the most basic of our laws and rules to the very people from whom the law emanates. This is where the advantages of a blog may be wielded in the most potent manner. As a means to communicate ideas and as a medium to educate and disseminate across borders of space, time, color or creed, the blog to date has few rivals. Its accessibility and informal nature allows for a freer exchange of ideas that cannot be had in more traditional cyberspace venues. The fact that there has evolved a new specie of cybercitizens called professional bloggers is testament to this fact. This legal blog hopes to achieve just that. 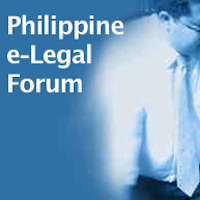 It is our sincerest wish that this blog will serve as a forum for discussion of Philippine laws and legal system for the benefit of the widest audience. It’s also our hope that this blog will serve as an informal, albeit controlled (read: ground rules), sounding board from which people from all walks of life may drop a line and pick-up a thing or two, so to speak, in a manner that will not only protect, but moreso promote, the munificence and majesty of the law, as well as the dignity of the legal profession.